Realignment was the wildest time in college football, but with the exception of the Big East, the power conferences all came through OK. But according to a report from the Omaha World-Herald, the Big 12 was nearly eviscerated in 2010, with five of its stronger programs sniffing around the greener pastures of the Big Ten. Lee Barfknecht reports that the curious schools were Oklahoma, Nebraska, Kansas, Texas A&M, and Iowa State. Was this a concrete proposal for realignment? No. But it was much, much more than cocktail-napkin speculation. 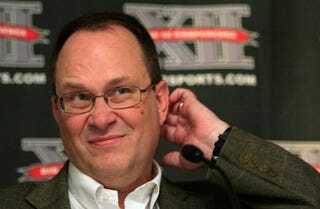 A Big 12 athletic director, who spoke to The World-Herald on condition of anonymity, said he contacted Big Ten athletic directors and presidents with whom he was familiar in June 2010. The topic: Was the Big Ten, which had 11 members at the time, interested in adding five Big 12 schools? The feedback from Big Ten school officials was positive, both sources said. The sticking point was devising a revenue-sharing plan to satisfy all. It would have taken at least three to four years for that many incoming schools to hit the financial payoffs sought for moving. Realignment couldn’t wait that long. Nebraska would jump to the Big Ten that year, as Colorado left for the Pac-10/12. The next summer, Texas A&M and Missouri went to the SEC. But it could have been much worse. Texas was reportedly very close to heading west, and if they had taken the rumored five schools with them, or if the Big Ten exodus had come to pass, the Big 12 would’ve been reduced to, basically, the AAC with slightly better name recognition. It’s an alternate history more terrifying than Nazis riding unicorns.